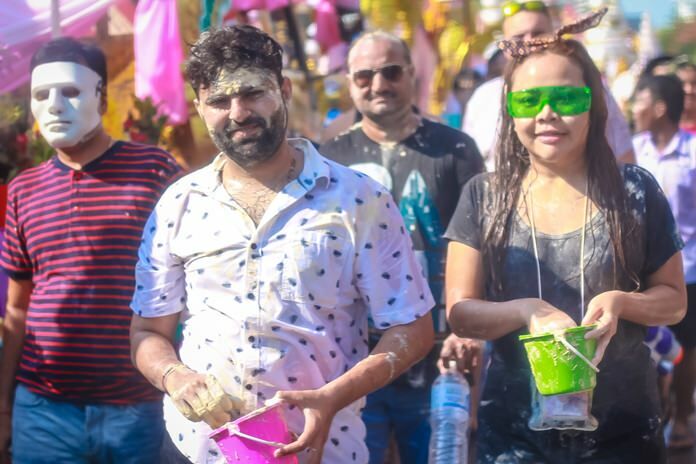 Songkran begins earlier and ends later in Pattaya than all but one Thai province and both tourists and locals make the most of it. 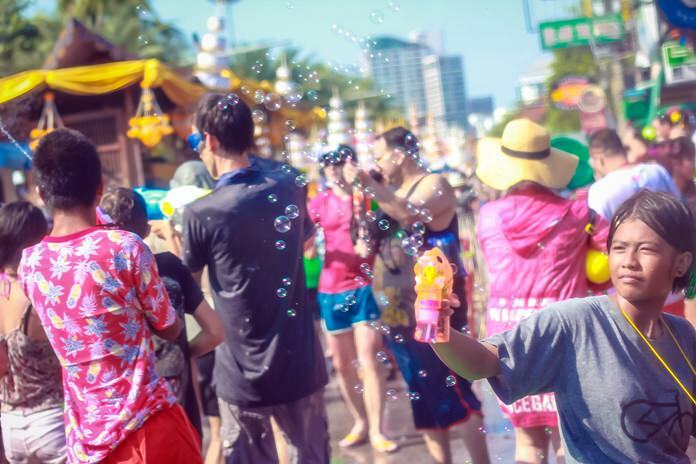 While the official / national holiday runs April 13-15, the manic water throwing starts as early as the 10th in Pattaya and continues until the final day on April 19. The event has the twin effect of filling up hotels and emptying condos across the city as tourists come for the fun while many expats flee the mayhem. 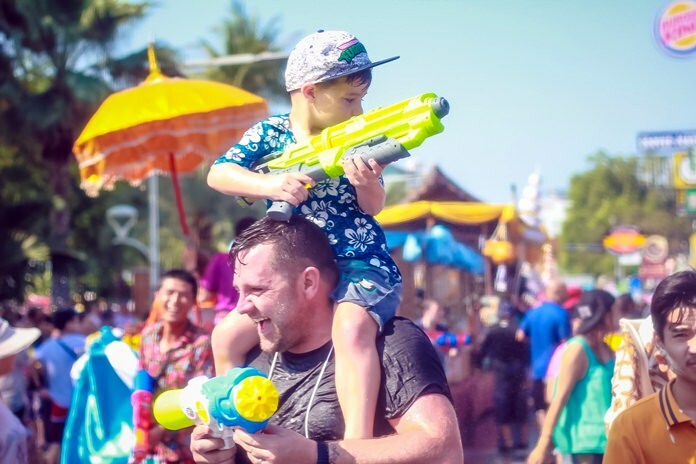 Songkran begins earlier and ends later in Pattaya than all but one Thai province and both tourists and locals make the most of it. 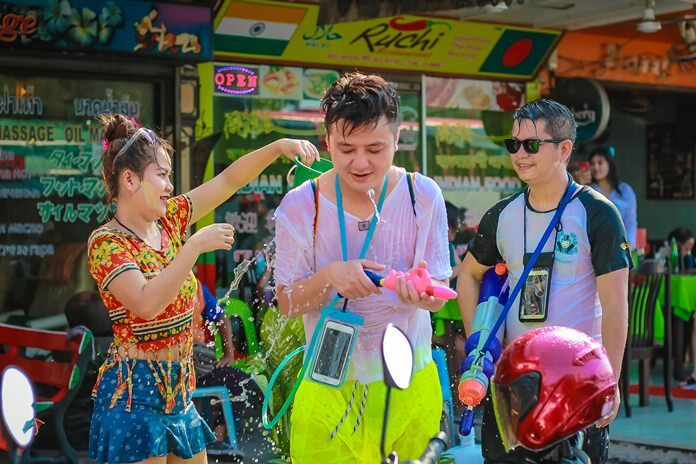 While the official holiday doesn’t come until April 13-15, the manic water throwing starts as early as the 10th in Pattaya, creating the twin effect of filling up hotels and emptying condos across the city as expats flee the mayhem overseas, or at least to areas that don’t engage in water warfare for 10 days. 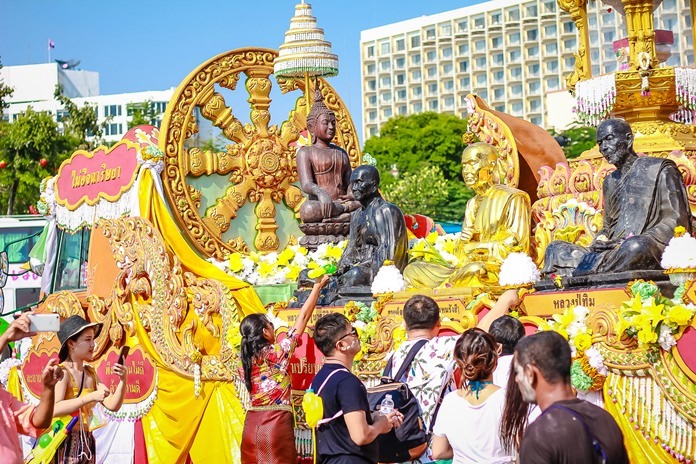 April 13, the official Thai New Year, at least saw some traditional reverence as Thais made their way to temples for meditation and merit-making and watched as the Sanctuary of Truth’s annual relics parade wound its way through the city. The nine relics came from the Busabok Stupa, which stands in the Sanctuary of Truth’s central hall. Taken once a year from the high perch where they were placed in April 2009 by the late Supreme Patriarch, they are put on flower-laden floats every April 13 and carried to six stops in Banglamung District. The procession began at 7 a.m., stopping at Chonglom Temple at 8:45 a.m., Nong Ket Yai Temple at 9:45 a.m., the Pattaya Floating Market at 10:40 a.m., Walking Street at 2 p.m., the Beach-Central roads intersection at 3 p.m. and the Crystal Palace Hotel at 4:40 p.m. before heading back to the Naklua sanctuary. 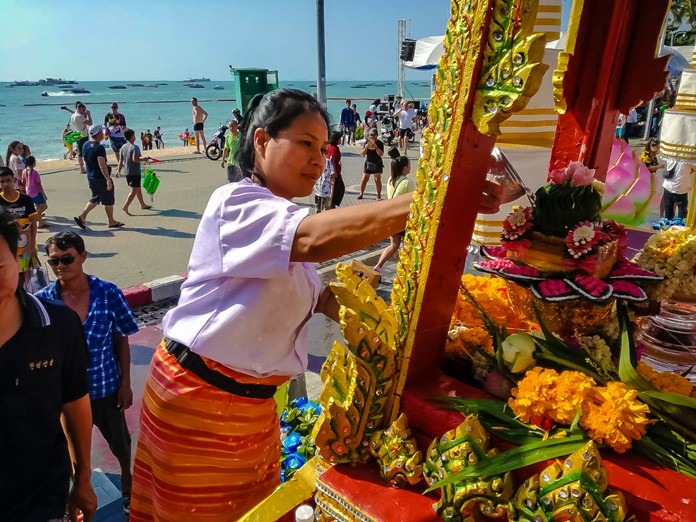 At each stop people – many dressed in traditional Thai clothing – were given the chance to pour holy water on the relics and make donations. Pattaya Mayor Anan Charoenchasri leads officials, family and friends to the events on Walking Street. City hall’s push for tradition played out on Walking Street, where Mayor Anan Charoenchasri opened Pattaya’s official Songkran festival with dances performed by students from city public schools and a parade through the nightlife district. 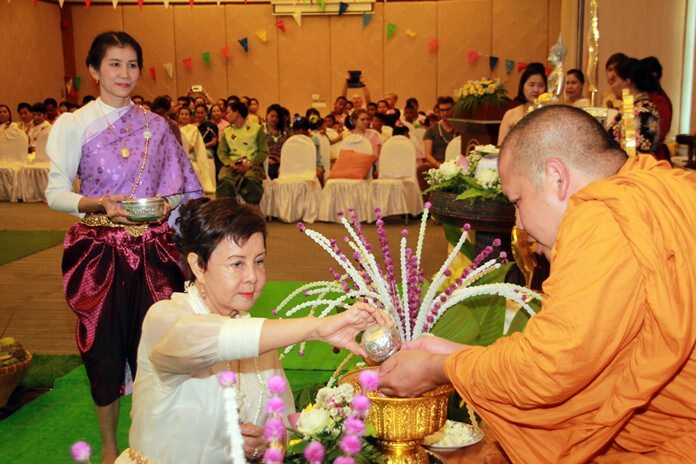 In Sattahip, the commander of the Air and Coastal Defense Command led sailors in a trio of traditional activities including giving alms to 10 monks, releasing 50,000 freshwater fish and pouring water on hot buffalos. 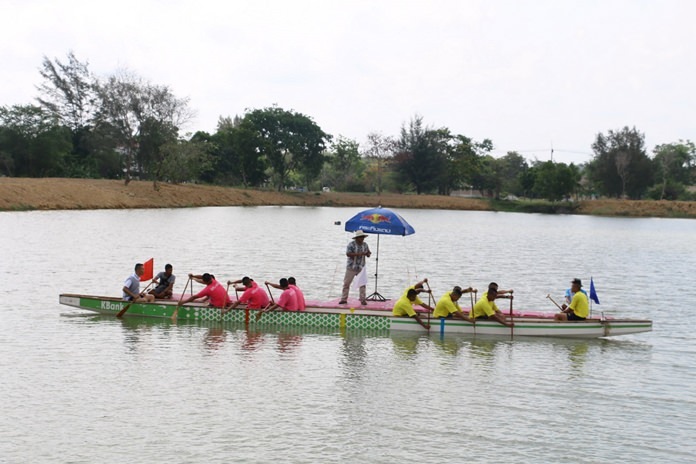 The event also offered sports and games, including tug of war on boats and “land rowing”. Sopin Thappajug, MD of the Diana Group joins the ‘Srong Nam Pra’ or lustral water pouring to celebrate Songkran. 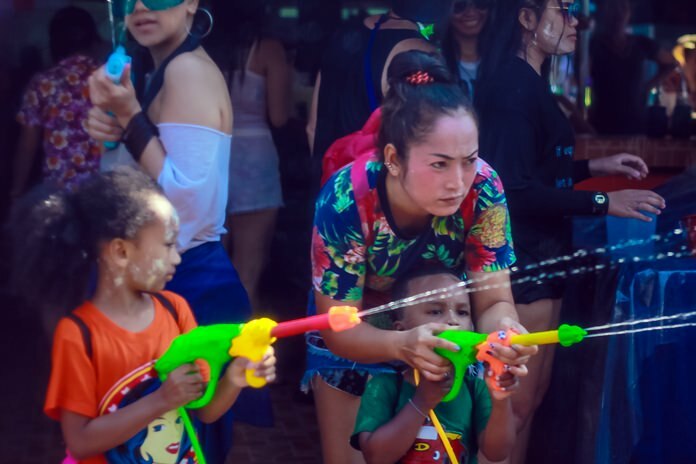 Once all the religious duties were observed, it was back to “Modern Songkran” which basically translates to getting drunk and silly with all manner of water guns. People, mostly foreigners, started as early as 8 a.m., but bargirls joined in as the beer bars opened in the afternoon. 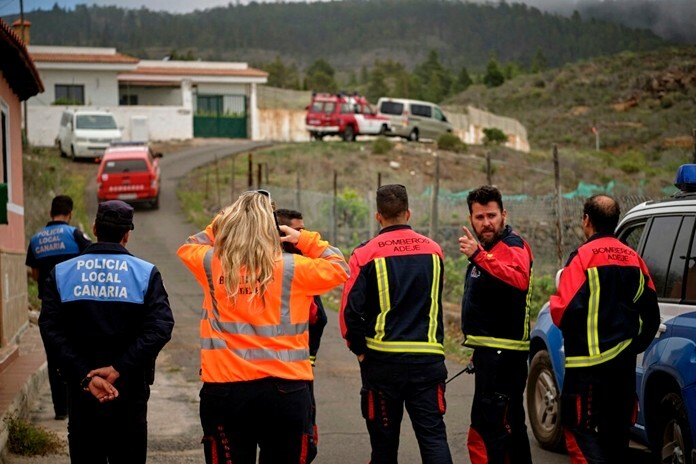 Local communities did organize some events to bring order to the mayhem. The Soi Khopai Community hosted stage shows, children’s performances and games with former Culture Minister serving as emcee. Beaches also were packed but most sun lovers went to Koh Larn to avoid the sniper attacks on baht buses and motorcycle taxis on Beach Road. 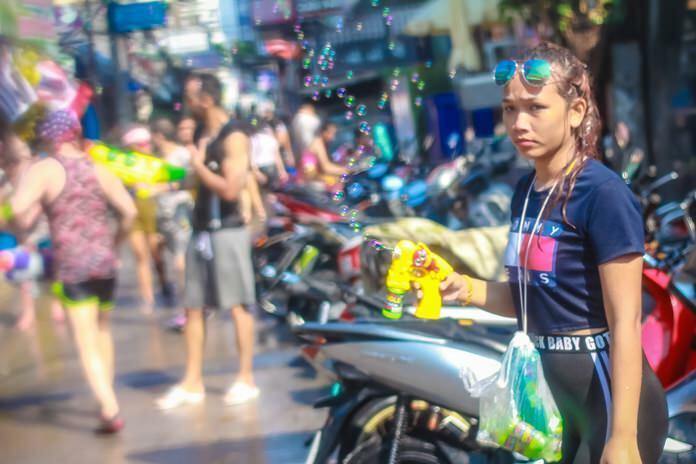 The mayhem continued through Pattaya’s grand finale on April 19, the time when nearly all Thais get into the water warfare and the city’s streets fall into gridlock. 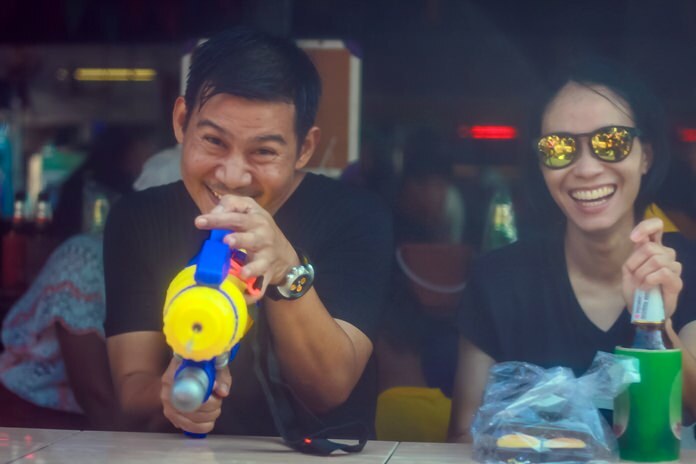 For those unwilling to engage in street battles, hotels offered a kinder, gentler Songkran. At the Centara Grand Mirage Beach Resort, nine monks from Nong-Or Temple were invited for New Year’s blessings before engaging in a morning meal. General Manager Dennis Schwartz then led staffers in the traditional ceremony where water is poured gently over the hands of the elderly. Sonthaya Kunplome pours lustral water on his elders in Soi Khopai. Of course, the hotel gave a nod to modern customs with a huge Songkran foam party in the afternoon. 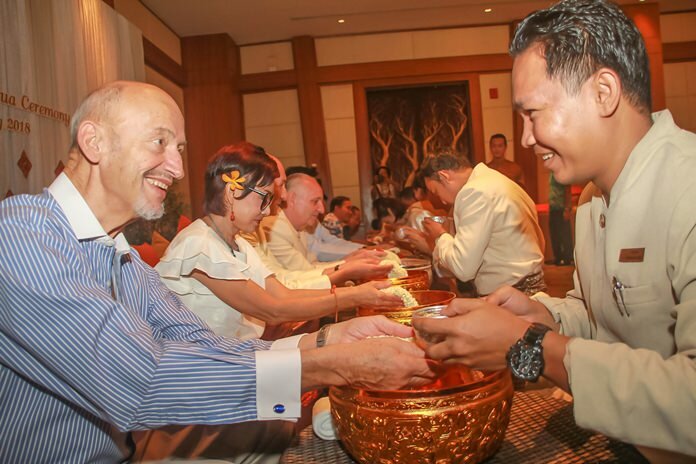 At the Centara Grand Phratamnak Hotel, Austin Robinson, the chain’s regional manager, hosted an alms-giving ceremony on April 11. Monks in the greater Pattaya area were invited to chant holy stanzas and to walk to collect alms of rice and dried food from hotel employees, who were dressed in Thai costume for the holiday. 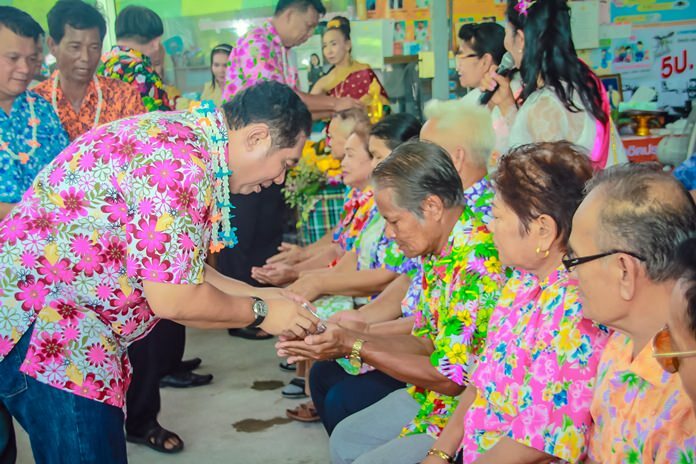 At the Diana Garden Resort, hotel group Managing Director Sopin Thappajug and Pattaya Police Chief Apichai Kroppech joined local community and business leaders for a traditional water-pouring ceremony. Ratchada “Toi” Chomjinda and children from the HHN were also present at the Diana Garden ceremony. Surasak Punnawutto, assistant abbot of Wat Sirintorntheparathnaram in Nakhon Pathom, also took part leading the chanting and prayers. 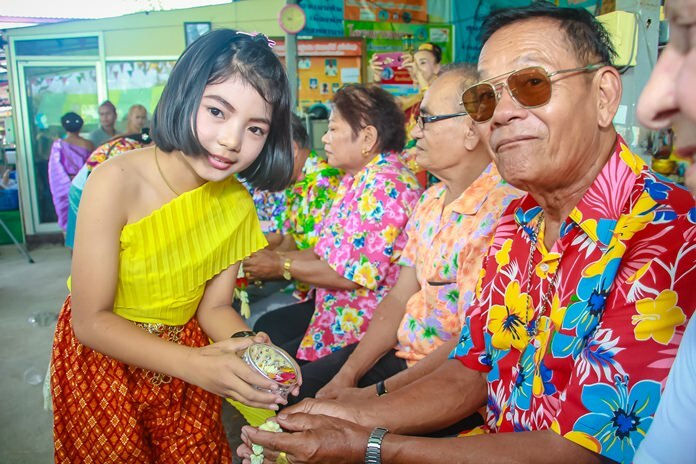 Tradition and merit-making also were the prescription at Bangkok Hospital Pattaya, which organized a “Back to the Ayutthaya Era” fair from April 12-18. Traditional Thai clothing, ancient music and sweets created during the era all were on offer, as well as booths offering free health checks and other services. 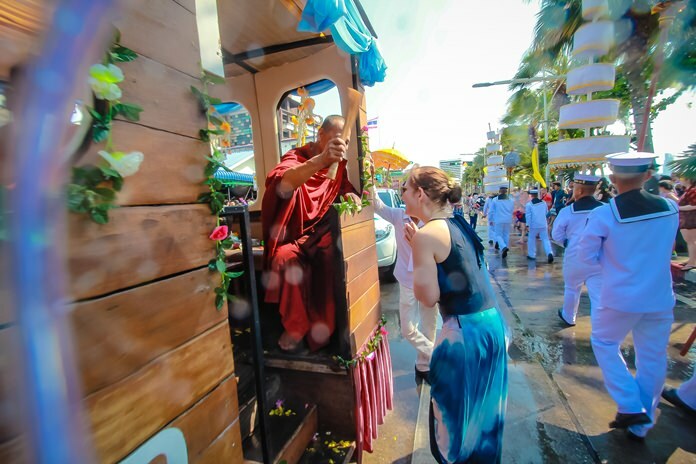 Residents and tourists pour lustral water on the Buddha relics when the parade reached their area. Throughout the 10-day Songkran celebration, police and soldiers kept security tight with police manning checkpoints across the area stopping vehicles to check for helmet and seat belt use, licenses and registration, and to check drivers for alcohol use and engines for faults. The relics parade makes it way to through Central Pattaya. 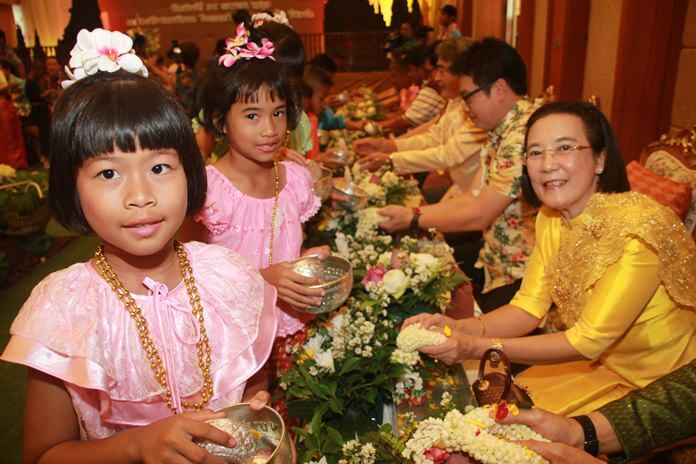 Traditional Songkran blessings at Centara Grand Mirage Beach Resort. This young future movie star takes part in a traditional lustral water pouring ceremony, receiving blessings from the elders in the Soi Khopai community. The evening stage activities included traditional Thai dances performed by children from local schools. 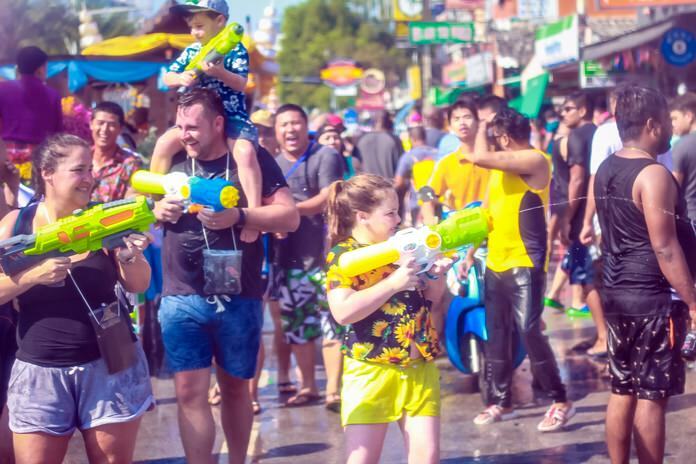 Everyone becomes a water assassin on Beach Road during Songkran. I’m the best gunman ever! It’s very hot so the ladies prefer to remain soaking wet. This tourist family is having a blast. Feel the wrath of the bubble gun! Beer bars are always the highlight of wild fun and excitement for tourists during Songkran. 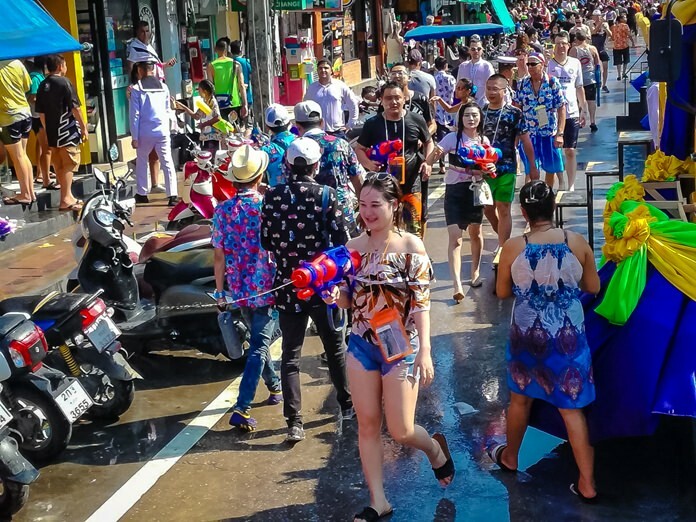 Almost all shops whose management dares to stay open take part in the modern Songkran festivities. Little man on top becomes a sniper while he rides his giant dad. 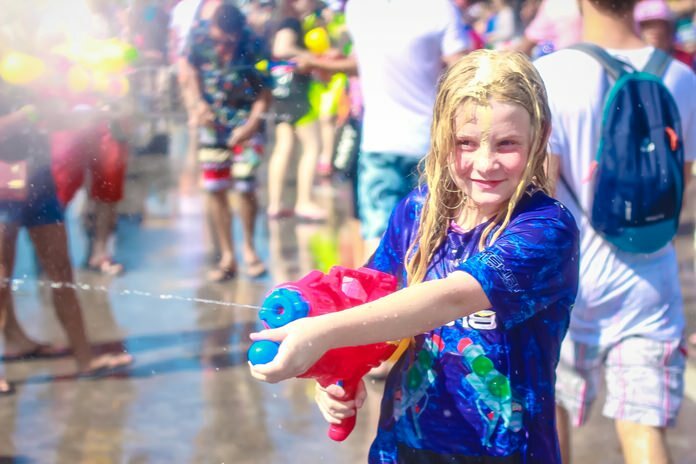 Family fun at the afternoon Centara Grand Mirage Beach Resort Foam Party. Some of our guests from foreign lands receive blessings from monks aboard the relics parade. 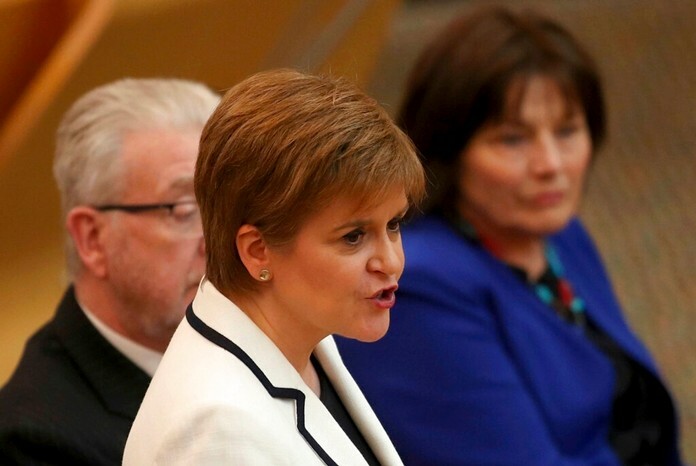 Behold the mighty bubble gun – resistance is futile. Starting at a very young age. If you come any closer I’ll shoot. Talcum powder “smearing” was discouraged in many areas of Thailand. Apparently these revelers didn’t get the memo. In Sattahip, the Navy events included sports and games, including tug of war on boats.